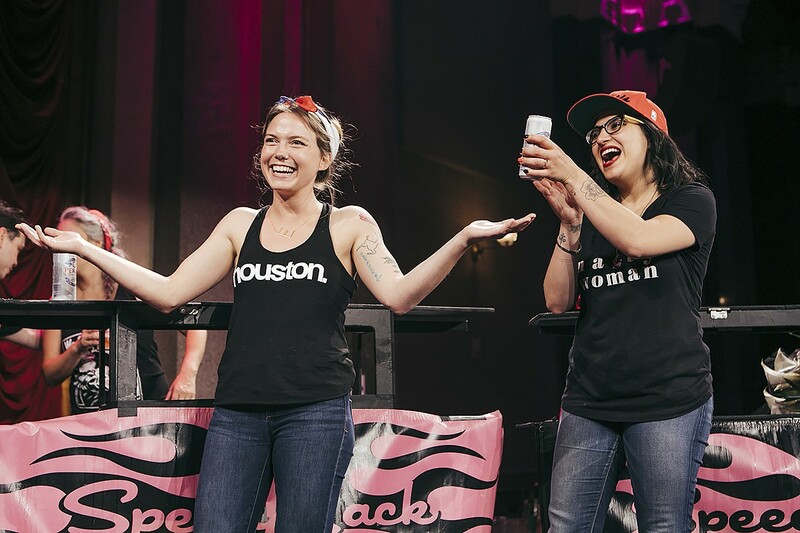 Last night in New York, Elyse Blechman of Tongue-Cut Sparrow in downtown Houston fought her way through the eight-round national Speed Rack competition to land second place. In the final round, she lost to Mony Bunni at The Kimpton Gray Hotel as well as Boleo in Chicago. Bunni is also the Chicago-area brand ambassador for Lustau Sherry. Blechman should still be immensely proud. Over 200 lady bartenders entered the regional competitions. Her notable accomplishment of being one step away from a win follows two years of regular practice at both Bad News Bar and Tongue Cut Sparrow. She landed first place in the southwest regional semifinals in February, which allowed her to compete against bartenders across the nation in New York. The grueling challenge involves making any of 50 classic cocktails that judges call for as fast as possible. Yet, the cocktails have to be accurate, too, as points are deducted for missing garnishes, drinks that are not cold enough and out-of-balance proportions. Competitors were given a list in advance of 50 classic recipes that they had to memorize—no time to refer to notes in this competition! National judges included Houston’s own Alba Huerta from Julep, who also placed second in 2012 (the first year of the competition), Dale DeGroff (reknowned author who’s nicknamed “King Cocktail”), Roxanne Spruance (chef and owner of Kingsley in New York), and renowned cocktail historian Dave Wondrich. Simon Ford, co-founder of Ford’s Gin and Robin Nance, brand ambassador for Auchentoshan Scotch, took care of the emcee duties. Speed Rack was founded by New York bartender Ivy Mix (now a partner in pan-Latin cocktail bar Leyenda) and Lynnette Marrero (currently beverage director at Peruvian-inspired Llama Inn). It’s purpose, besides showcasing women bartenders, is to raise funds for charities that fight breast cancer (hence the “Rack” part of the name). Since its inception six years ago, Speed Rack has raised over $550,000 for charities.